Ralph Nelson Elliot, the father of wave principle discovered that stock market prices moves in recognizable patterns which he defined as “waves”. A wave is an oscillation accompanied by a transfer of energy that travels through space or mass. In stock market context, the action or reaction of prices in one direction or the other is a wave. 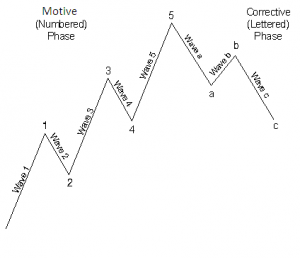 He discovered five isolated patterns which occurs again and again in the market price data and how they link to form larger versions of these patterns. We would say that this is the best forecasting tool in existence. Nowadays, many elliotticians predict the markets by pin pointing the tops and bottoms with success. In 1940’s when Dow Jones Average was at 100, Elliot himself predicted the bull market of next several decades which will beat all expectations. At that time most investors felt it impossible and were not even expecting DOW to break highs of 1929. 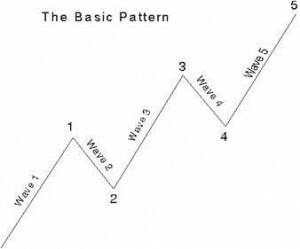 Let us discuss the basics of Elliot waves, which starts with the five-wave pattern described by R.N. Elliot. Markets progress in five waves of which 3 waves give directional movement numbered as 1,3 and 5. While the other 2 waves are the interruptions in the directional movement or counter trend moves numbered as wave 2 and 4. The basic pattern of the five waves can be described by below figure. Wave 2 will never go beyond the start of wave 1. Wave 4 never enters the price territory of wave 1, i.e. the low of wave 4 will not break the high of wave 1. There are two variations of wave progression – motive and corrective. Motive waves are 5-wave structures while corrective waves are 3-wave structures. The above figure is a variation of motive waves. While in itself, the waves 1, 3 and 5 are motive waves which will sub-divide into 5 waves. And, wave 2 and 4 are corrective in nature which sub-divides into 3-wave structure. The complete cycle consists of 8-wave structure where 5-wave structure is motive and 3-wave structure is corrective.